I finally completed my full board on NYE. 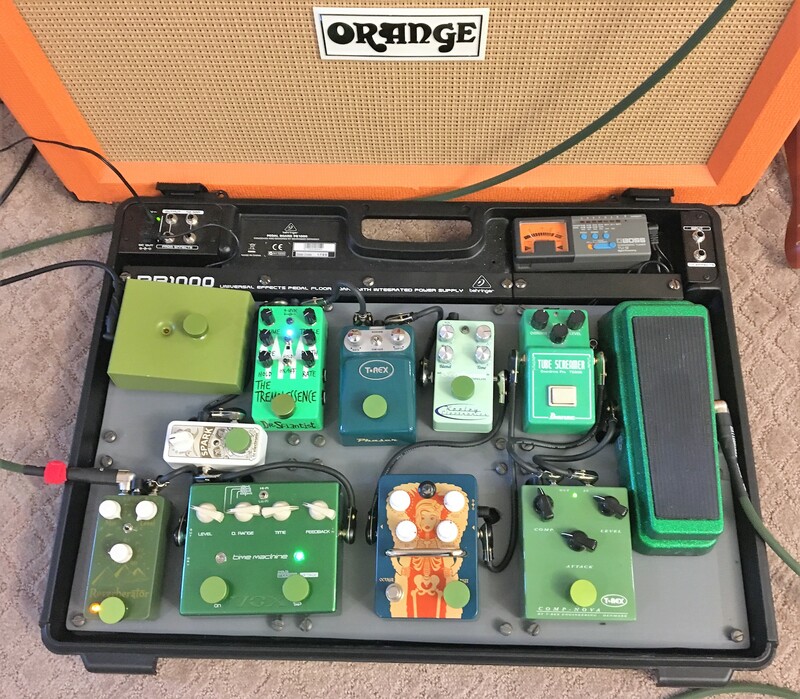 I wasn’t initially headed for an all-green board but after the urging of my daughter to paint the Wah, I found myself, by happenstance, four green pedals deep. After seeing a post here with someone’s monochromatic black & white board, I was fully decided and the hunting began. Took a little longer than I hoped to collect them all, but with help from the holidays (I sent everyone links of board-related gear if they asked if I wanted anything…) and a couple of excellent folks on Reverb I was able to get my hands on the last few things. I’ve never been a “pedal guy” and I spent most of my gigging days playing Guitar>Amp with occasionally the TS-808 added (more often for more cable than anything). Now that I’m a little older and trying to get back into playing, I didn’t really know what style of music I might end up playing so I wanted to have a fairly versatile set up. I redid the backing-board on the original Behringer board with Baltic Birch and drilled it out for the original bolts (now glow-in-the-dark green) and the power supply to come from underneath (to keep the board cleaner). Then I added the green buttons as a last-minute addition…probably will take the one off the Fur Coat in favor of two matching ones. I’ve had limited playing time on the new setup so my reviews are limited in scope but hopefully they’ll be enough for now! Rattlesnake cables: I hadn’t bought new cables in 10+ years and most of my patch cables were pretty shoddy. I heard about these guys through the band Earthless and did some digging. I ended up getting their 10-pack patch cable pack, which has flat neutriks plugs and gives you a variety of sizes that somehow worked out almost perfectly for me. I also did a 10’ “Snake Head” cable with two angled plugs (the last foot or so is heatshrinked as opposed to wrapped so it doesn’t scratch your guitar) to run Guitar>Board. From the Board>Amp, I did another 10’ (standard) with one angled end to fit on the board. These cables are AWESOME! Its crazy how much they cleaned up my signal path and their quality is way better than the Monsters I was running before. Jim Dunlop Wah Classic (Fasel): Classic Wah sound, nothing interesting to report there. I did the refinish on it (see my older post for more on that) to the sparkle green and it came out fantastically! I’m sure there’s a “better” option out there but this one works; for now. T-Rex Comp-Nova Compressor: I really like this pedal, even though it is a little large for a compressor pedal. Sound is great and very sculpt-able. I also like that it is a little more transparent than some other compressors I’ve played (read, less compress-y) and the avocado color is perfection for the palette. Ibanez TS-808 Tube Screamer: Needs no description, this was actually my first “green” pedal…got it probably a decade or so ago. Orange Fur Coat Fuzz/Octave: My first venture into “fuzz.” I really like that the octave is selectable on top of the fuzz and the knobs can really mold the sound. I do find it kicks into feedback fairly quickly with the Jazzy, but on my Gibson it sounds great. I find myself fiddling with the knobs more than other “dirt boxes” than I’ve played but I’m not sure if that’s indicative of fuzz in general. I contemplated going Russian Big Muff but I’ve had crummy luck with EHX quality. While the color is more blue than green (it’s on the border) I love the decal/image. Keeley Seafoam Chorus: This sounds lightyears better than the Small Clone that I had awhile ago. It can be pretty light/transparent all the way up to really thick 80’s style chorus. T-Rex Tonebug Phaser: This has surprisingly good tone but it does drop volume a bit when engaged. Its likely the “lowest” quality pedal on the board and I was tempted to snag a Keeley Phase 24 instead but I couldn’t justify doubling the price point on a pedal I rarely use…I got this for a screaming deal so its hard to turn down. Dr. Scientist Tremolessence: This pedal is rad! Tons of flexibility, sounds great, really controllable. I had an EHX Worm previously that I liked the Trem setting of but found it noisy; this is not. It can almost work as a treble booster too. I’m just scratching the surface really with this one still. TC Electronics Spark Boost: Pretty straight forward. And yes, while I realize it isn’t overtly green, I did refinish it to glow-in-the-dark green. Hard to get a good photo of, but it worked out pretty well (with a good amount of UV charge). 20db of clean boost, I use it more as “drive” than true boost, especially since the reverb at the end of the line has a clean boost function to help counter signal loss. Dr. Scientist Reverberator: Probably my favorite pedal on the board. Versatile, sounds great and very “true”, selectable between long and short decay, Room/Hall/Plate/Rotary, and you can get “spring pop” with the toggle. It was actually the last pedal to acquire, which is unfortunate because its now the one I’m using the most. Boss TU-12 Tuner: Not the traditional choice but I’ve had it forever so I threw it on here; plus it is stupid accurate. If I get the opportunity to start playing out again, I’ll likely swap this for a TC Polytune 3; which should fit in the lower right corner (sideways). Orange Footswitch: refinished this one from the original White to fit the palette better too! Orange AD30HTC thru Orange PPC2x12. Orange Bass Terror Combo. Gibson ES-333, Gibson SG Bass, Custom Built Jazzmaster, Les Paul Custom, Kalamazoo KG-1A, Gibson J-45. I had a TS808 for a while, very nice pedal. I have the Vox Time Machine too. It's an excellent delay. Super easy to use, sounds great, and the chicken head knobs are foot adjustable on the fly. One of the pedals I use the most. By the way, mine is really quiet.